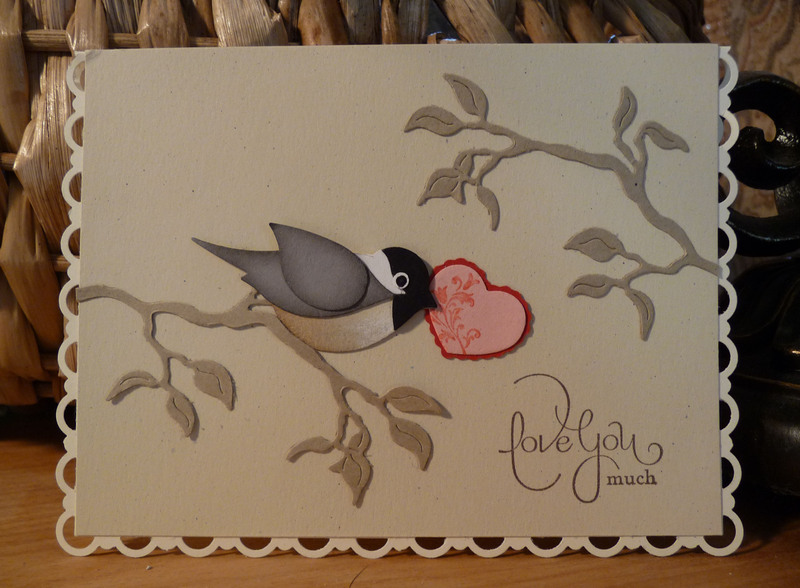 This card is very quick and easy to make, once the chickadee is made that is. For a list of supplies and detailed instructions on HOW TO MAKE THE CHICKADEE, CLICK HERE. The list of supplies and instructions for the rest of the card are found below. Cut a piece of Very Vanilla 8-1/2″ x 5-23/32″ –just a tad shorter than 5-3/4″– (21.6 cm x 14.5 cm). These exact measurements are important to make sure the scallops punch nicely all around the edges. Punch all four corners with the scallop corner punch, with the back side of the punch facing you to make sure the card stock is lined up properly. Punch the sides with the Scallop Trim Border, using the printed guides on the punch for proper positioning. Score card stock lightly, fold and line up scallops before fully pressing down the fold with your bone folder. Cut piece of Naturals Ivory 4″ x 5-1/4″ (10.2 cm x 13.4 cm), stamp greeting on lower right corner. Die cut the branches with the decorative strip die in Kraft, and 2 layers of the heart with the Beary Lovely Die in Real Read and Pretty in Pink. Stamp flourish design from Tiny Tags on heart in Real Red. Mount all the die cuts and the chickadee on to the Naturals Ivory mat, then glue the mat to the scalloped base of the card. This entry was posted in Big Shot, Punches on January 9, 2010 by Ann.